We encourage you to design a website that stands out because of its unique design and elements. 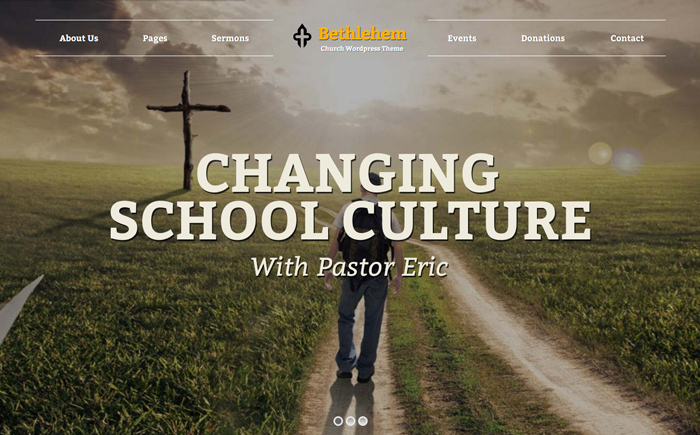 When it comes to creating church websites, adequate information is a critical part which often misses. 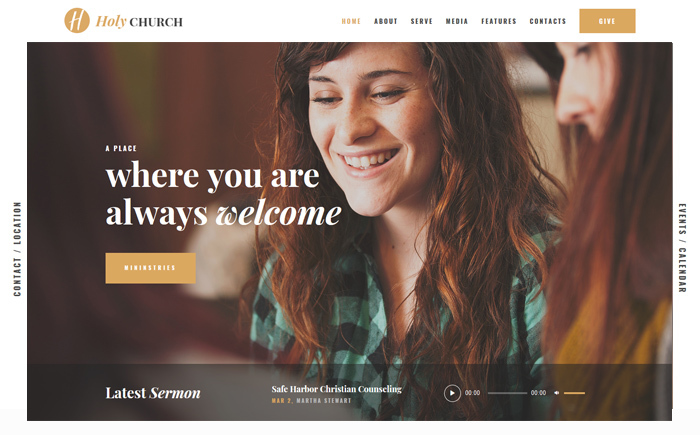 Which Modern Church WordPress Themes to Look For? The thing is that we often forget that people usually want to attend a church, meditation center or any other believer community nearby. Indeed, Google map integration is a big win-win. What’s more, show your address on every page of your website. Next thing, your audience wants to find the service times in a matter of seconds. So, compatibility with The Events Calendar plugin is another +1 to your karma. At the same time, you can add a short video introducing your organization and its ministerial staff. Besides, publishing upcoming events and news is another great way to engage and convert visitors. As you see, there are enough things you should pay attention to before launching a website. Discover our list of 20 modern WordPress themes that help improve your online presence and encourage newcomers to step through your doors. Indeed, for more inspiration check out the best WordPress themes and find your win-win solution. Good luck! Want to build a decent website but do not want to bother with coding? Free Church can help get you started. A clean design, large-sized elements, responsive layout and metro-style icons and fonts come jam-packed into the theme. What’s more, the theme is WooCommerce ready and supports The Event Calendar Pro, donation system via PayPal and sermons plugin. 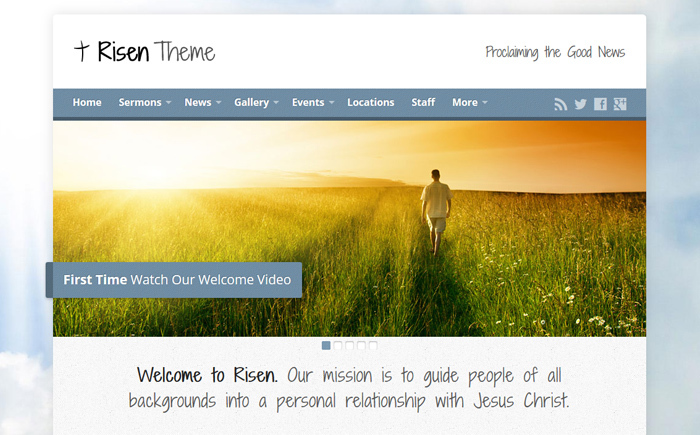 Here’s another clean specimen of the modern church WordPress themes to invest. Crafted for churches, charity, and non-profit organizations, Holy Church is here to help you build an online presence. Well, it allows you to create unique layouts without having to hack into any code. Besides, it supports Events Calendar, WPBackery, and ThemeREX Donations plugin. 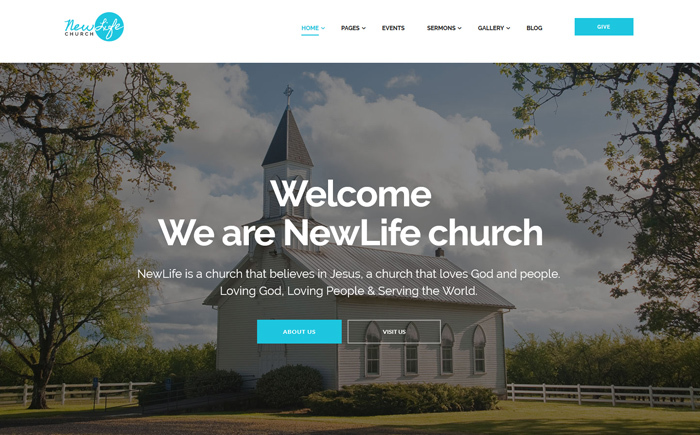 With the focus on a clean and sober concept, New Life is an ideal solution for non-profit organizations of all religious kind. Indeed, it adapts to all browsers and screens with ease. The powerful drag’n’drop functionality allows you to create unique layouts on a go. Besides, New Life comes with tons of documentation and amicable customer support. Take a look at Pastor’e. 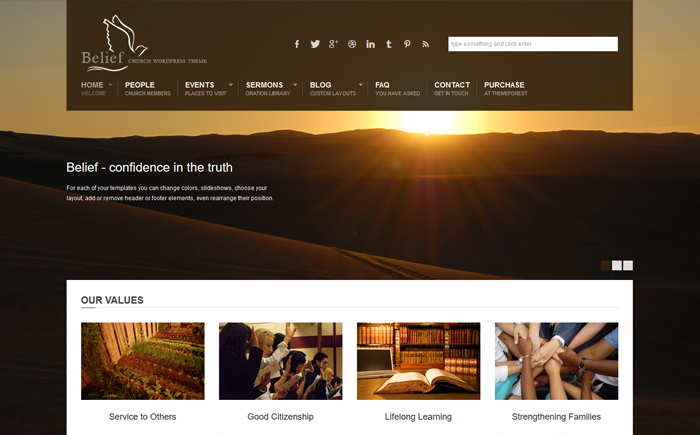 This modern WordPress theme fits great for churches, prayer groups, volunteering and non-profit organizations. Next, thanks to Events Calendar you can create and show upcoming events and religion news. Plus, turn your website into an e-store selling Christian literature, gifts, and apparel. Finally, it comes integrated with ThemeREX Donations plugin. Looking for an amazing solution for your non-profit organization? Faith & Hope suits great for contemporary churches, believer communities and volunteering organizations. What’s more. its clean design will adjust correctly across different last-generation devices. Apart from this, it’s compatible with WPBakery, ThemeREX Donations, and WooCommerce plugins. Enjoy its multiple layout features and lots of shortcodes. Often, a modern WordPress theme designed by pros can make a huge difference. 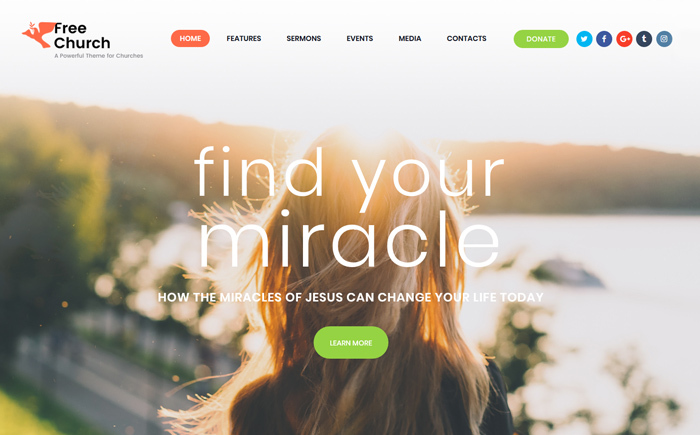 For example, Grace makes it easy to build an attractive and fully-functional church website for less. Thanks to tons of customization options, it’s easy to change almost every design element to make a great impression on your visitors. Indeed, it’s responsive, WooCommerce ready, and supports ThemeREX Donations plugin. 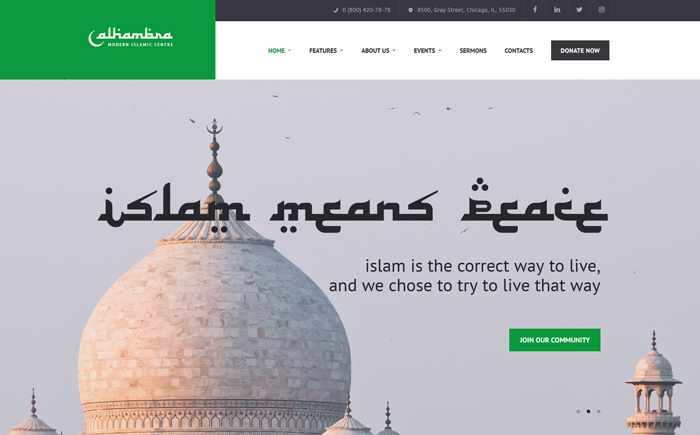 Alhambra is a nice specimen of the modern church WordPress themes that can ease your pain while building a website. You might be happy to know that it supports RTL which allows you to switch your website to Arabic. Besides, it’s easy to create Sermons, divide them into categories and display in audio and video formats. Let your visitors enjoy a truly responsive design of your website on any last-generation device they are on. 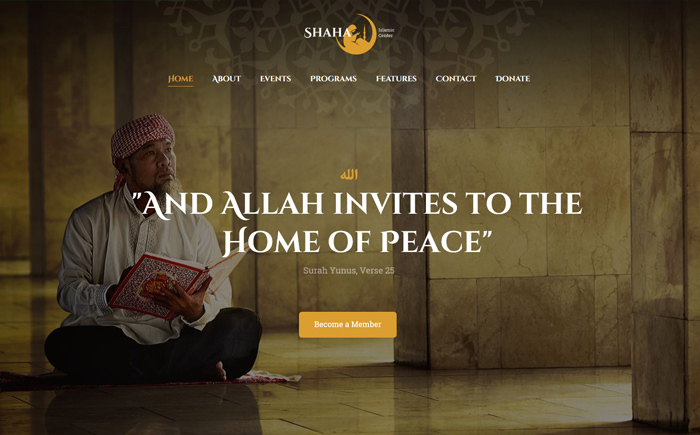 Meet another modern solution suitable for Islamic centers, Mosque, and non-profit organizations. Shaha comes with all necessary features and customization options you might need to make your website stand out from the crowd. Next, it supports RTL version, Events Calendar, and ThemeREX Donations plugins. Thus, it offers multiple layouts, intuitive navigation, lots of shortcodes, and advanced blog settings. Need to create a Buddhist website of any kind? With Great Lotus, you get a win-win solution built to impress. 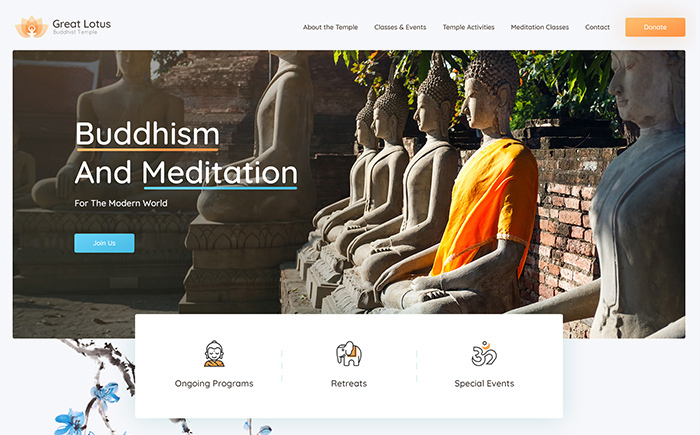 Whether you need a website for prayers and monks, or meditation practices, Great Lotus includes as many features as possible to match all possible requirements. What’s more, Handy Classes will notify your users about every cultural event you want to hold. Discover the power of Great Lotus now. Still afraid of building websites because of no coding skills? No problem. Church and Events designed to get you through that day job with ease. So, feel free to create a website of any kind, including church and charity. 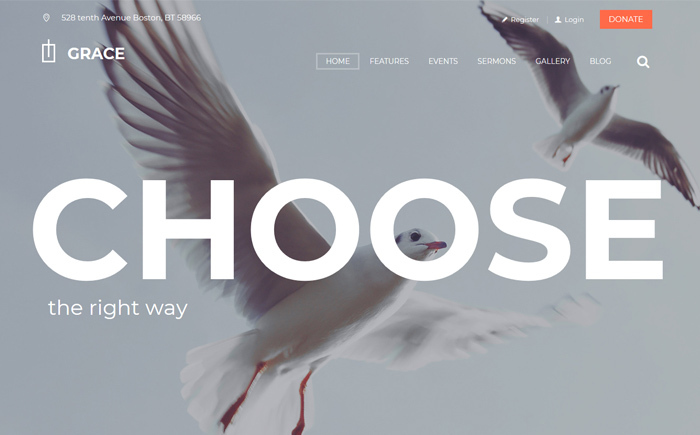 LEarn what comes jam-packed in this responsive and modern WordPress theme. Did we mention that it supports The Event Calendar Pro, Filter Bar, WooTickets and Community Events add-ons? Church is a classic solution that can best represent your non-profit organization. It fits great for church, donation, sermons and events websites. Moreover, its responsive design allows enjoying its awesome design on any screen sizes of any devices. With multiple layouts, it’s easy to find the right one that suits your particular needs best. Besides, it offers different post types to help you create your pages as you want and need. 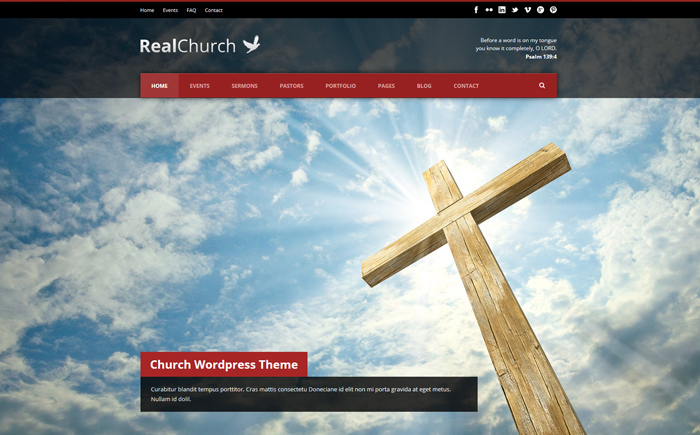 Enjoy another clean specimen of the modern church WordPress themes worth to invest. WP-Church offers a top-notch solution that can help you create a professional website with ease. So, it offers unlimited team pages, Google map integration, and compatibility with Events Calendar plugin. Besides, it includes a custom gallery with countdown timer and upcoming events widget. 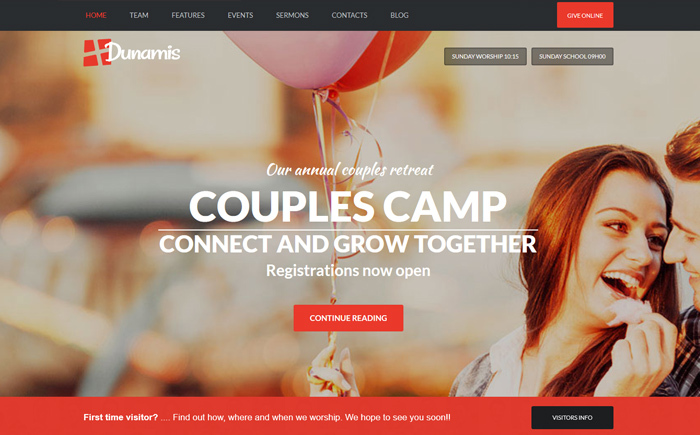 Dunamis has everything you need when creating a website related to churches and religion. Its modern and responsive layout adjusts awesome to different screen resolutions and devices. Besides, it supports donations, od Podcasting, blog and events functionality. An intuitive drag’n’drop interface, comprehensive donation manager, and lots of shortcodes come jam-packed in the package. 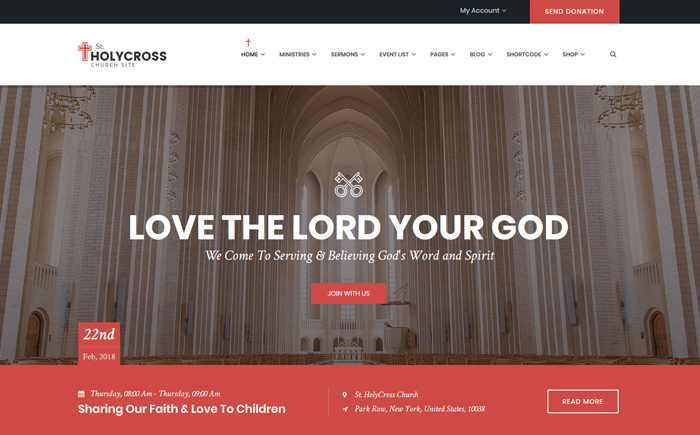 Take a look at this responsive WordPress theme designed for churches and non-profit organizations. Experiment with lots of customization options to make a great impression on your visitors. Besides, it’s SEO-friendly, cross-browser compatible, and well documented. What’s more, you can choose between a light and dark appearance, multiple colors, and 19 preset backgrounds. How to save over $200 on custom plugins? Grab one which offers a set of plugins worth its price. 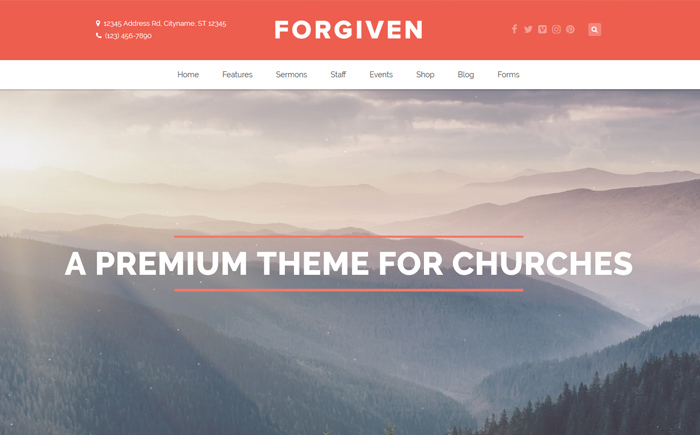 Forgiven is a nice solution for your future church website that looks awesome on all modern devices. Besides, it supports WooCommerce, The Events Calendar, and The Events Calendar Pro plugins. Experiment with theme’s settings and customization options to give your visitors a reason to come back. 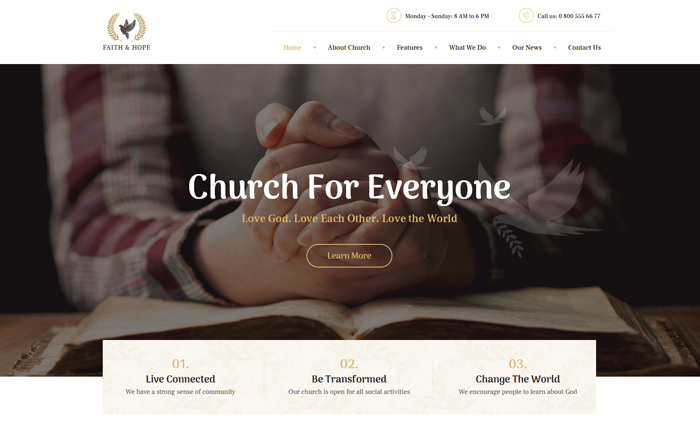 Here’s another specimen of modern church WordPress themes suited for any kind of church websites. 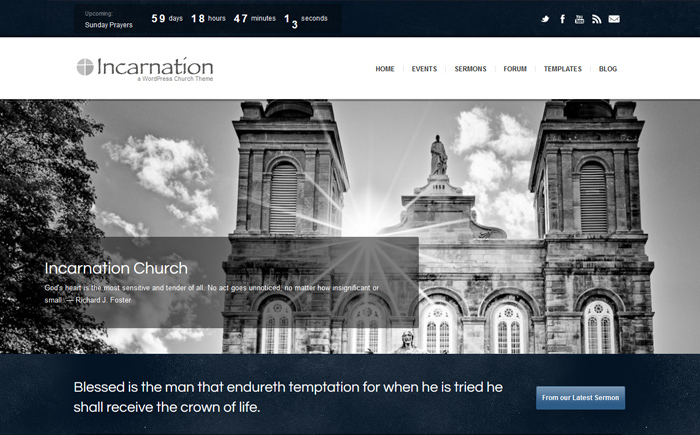 Built on top of the fabulous Avia framework, Incarnation supports WPML plugin. A plethora of advanced options, 10 pre-defined skins, multiple slideshows, a set of custom widgets, and much more. Keep in mind, that Incarnationis compatible with bbPress and WPML plugins. Tweak the overall look of the theme until you are proud. Are you trying to improve trust in your non-profit organization? Start from building a professional web presence with Life Churches. Well, it looks great and fits for all traditional and modern churches and religious organizations. Thanks to WooCommerce integration, it’s easy to launch a modern e-store and sell different religious literature or gifts directly online. Don’t bother with coding, just drag’n’drop unlimited elements in the page and customize it. Enjoy this flexible and attractive WordPress theme designed for non-profit organizations and corporate projects as well. Ease your pain with multiple home page layouts, tons of customizable options and popular plugins included in the package. Beside, Bethlehem offers 8 header styles, Event manager and WooCommerce integration. Manage your navigation and create mega menu, insert icons and showcase your favorite images. 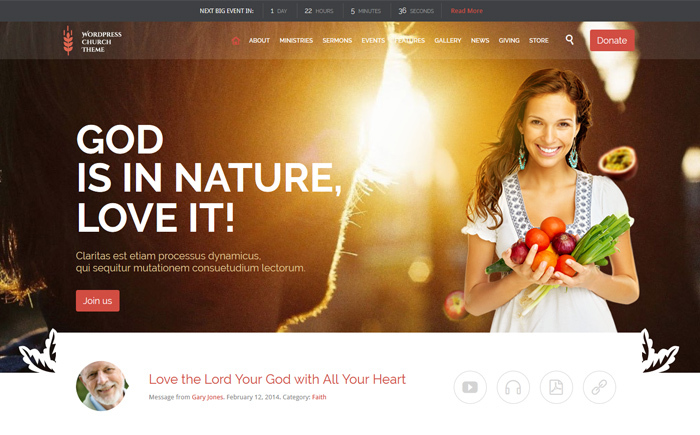 Don’t shy away from this specimen of the modern church WordPress themes crafted by pros. The thing is that it comes with an intuitive drag’n’drop page builder to help you display any content type you wish on any page. No coding skills. Treat yourself to multiple advanced features and customization options that can save the day. Besides, you are free to choose different colors for your body and headings. 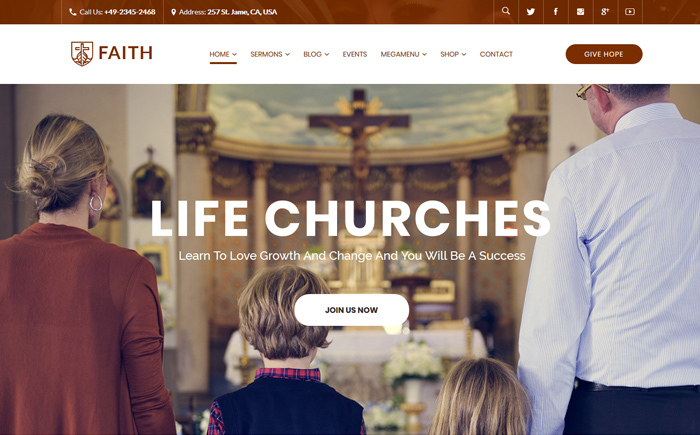 It’s a good idea to pick Real Church and build a professional church website hassle-free. This powerful SEO-friendly solution can help draw organic traffic to your web project. What’s more? 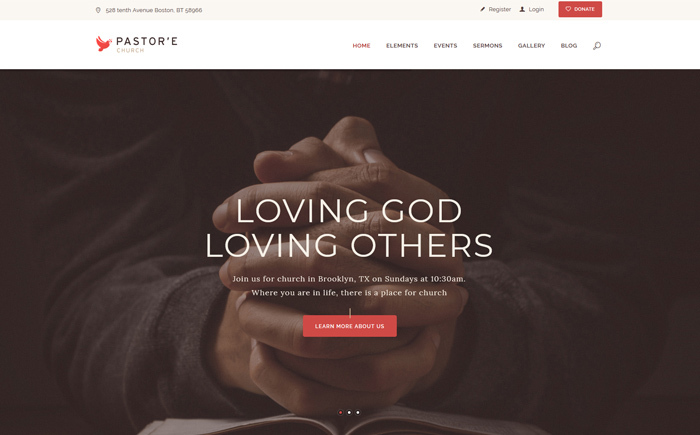 Well, it’s responsive and Retina ready, compatible with WooCommerce, and supports Sermon post type. Start promoting your website with a blog to reach a wider audience in a shorter time period. 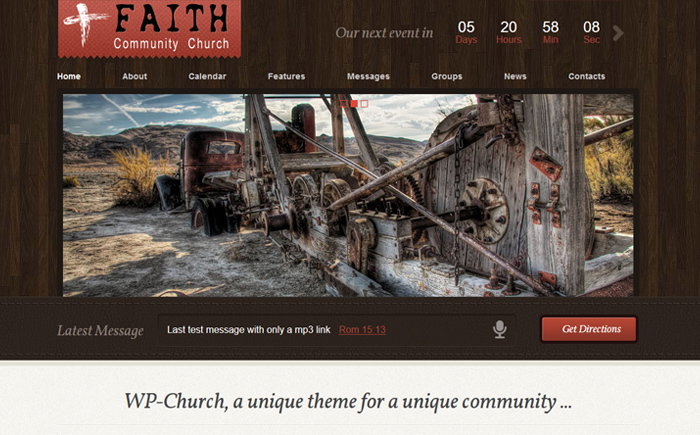 Long story short: these modern church WordPress themes are worth exploring. Enjoy their live demo to learn more about these modern solutions. Then, make your pick. The more you can do to show that your non-profit organization can be trusted, the better. Finally, which one is calling your name?